The people who make Nalgene water bottles assumed that J. made a mistake, and J. doesn’t mind at all. “Empower every employee to make timely decisions and do what is right for our customers,” reads the note that the company sent along with his order. What wonderfully empowered thing did they do for him? He was ordering a replacement for his old bottle’s cap, which had been damaged in what he calls “an unfortunate dishwashing mishap.” While he was at it, he ordered a second bottle in a different size as well. How could that become an example of amazing customer service? 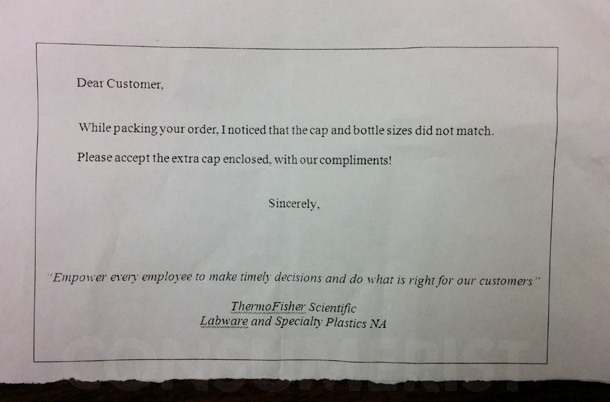 The person picking his order looked at it–one size of bottle and an extra cap in a different one–and wondered whether he had made a mistake and really meant to order a replacement cap for the new bottle. What was this person “empowered” to do? Throw in an extra cap for the new bottle, too, just in case he really had made a mistake.